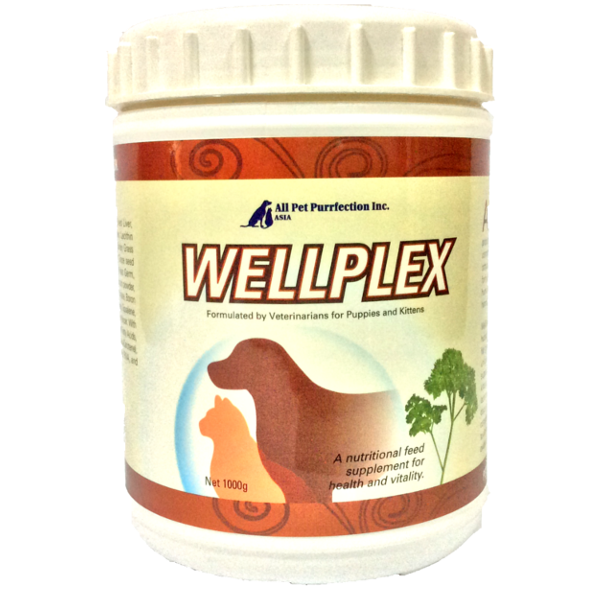 WellPlex is a unique, multi-tiered system, designed to support animals under stress or growth, like puppies and kittens, during pregnancy, and lactation, for racing dogs, working dogs, and show dogs. It is designed to complement and fortify any diet with regard to vitamin, mineral, trace element and anti-oxidant requirements. *It contains Hyaluronic acid (HA) and Glucosamine & Chondroitin to support joint and cartilage health, Omega fatty acids ( Omega – 3, Omega – 6, Omega – 9 ) and powerful antioxidants for the skin and coat. Colostrums are a potent source of immunoglobulin (antibodies) and non-specific immune system stimulators like “transfer factor”. It includes a blend of herbs, and nucleic acids noted for their ability to stimulate gastric secretions and facilitating the uptake of essential nutrients in the intestinal tract and their unrestricted availability for every multiplying cell. These natural ingredients also serve as a source of natural vitamins, minerals, digestive enzymes, carbohydrates, protein, chlorophyll, and fibre to ensure optimised general health, improved development & growth, and enhance performance. Dolomite, Flax seed meal, dried liver, brewer’s yeast, kelp granules, lecithin granules, parsley powder, barley grass powder, milk thistle extract, grape seed extract, ginger, green tea, wheat germ, vitamin C, garlic powder, colostrum powder, shark cartilage powder, zinc chelate, boron chelate, tocopherol, tocotrienols, Squalene, Lycopene and human grade palatability enhancer. With a proprietary blend of essential fatty acids, Carotenoids ( alpha-carotene, beta-carotene ), Phyto-hyaluronic acid, Purified RNA, and Purified Nucleotides. Suitable for adult dogs and cats, during pregnancy, and lactation, for racing dogs, working dogs, and show dogs.